Sorry about that, i hope I can fix it soon. This item is great for sitting on or putting under items like fountains, but my favourite use of it is putting lots of them on your garden and sit on them pretending you're an insect. Yep, there are tons of marvellously peculiar insects around, right? In other news, remember to comment if you want me to draw a picture of your animal/someone's animal/practically anything around Jamaa! I am currently working on one of myself and one of Julian2, which was requested by spots58. Happy Jamming and don't forget to comment! -MCB who is to lazy to upload the signature because after all it's Sleepy Sunday. While she glided over the canyons, the majestic young eagle which was searching for crystals thought about how things used to be in that desert. It brought her so many memories. Years before, in that desert, two adult eagles were chatting over the nest. The eggs would probably hatch soon and they were very eager to get to know their sons and daughters. Sharpeye and Lightstar. They were probably the most happy and kind couple in Eagle Rocks, the desser in which the whole clan of eagles lived. Even the leaders of the clan had two recognised that the two of them were great flyers, intelligent and generous, great members of the society. All the clan was eager for their eggs to hatch. But they didn't notice the black cloud. As soon as Dusty, the eldest eagle, saw it, he paralised with fear. He had heard lots of stories about phantoms, those hideous creatures who took over lands, making animals who had lived there all their lifes move away. Dusty had heard that most of the animals that had had that experience had found a home in a magical and faraway land called Jamaa, but he wasn't sure about how eagles would adapt to life there. And the clous kept getting closer and closer, until it blocked all the light. Everyone was panicking. The leaders tried to put order, but everyone just tried to save themselves and protect their eggs. "Quick!" said Lightstar. The leaders were giving out sacks from the abandoned saloon, and everyone was filling them with their eggs and flying away with them. Days later, all the eagles had found a spot some distance away in which they hid with their eggs. It was a rainforest, full of places to hide and trees to make nests on. And about a week later, the whole clan was starting to forget about the phantoms and how they probably wouldn't be going back home, because eggs were starting to hatch. But it was in that moment of joy in which the phantoms came back, and started shooting rays at the eggs, and electrocuting the eagles. "What creature" thought Sharpeye, "is capable of such evil acts? What kind of demon would break eggs?" But as everyone knows, phantom's objective is just to cause chaos and destruction, and they are too evil to even wonder about other's feelings. One of these phantoms was really enjoying himself, shooting his blue rays and filling himself of satisfaction every time he killed an eagle or broke an egg. He even used his mental powers (which all phantoms have because their lack of paws mean they cannot hold anything, and their legs are only for flying) to throw rocks at all the nests. But suddenly this phantom heard a cry, the most deep and terrible scream of pain, and he saw a nest full of broken shells and dead chicks. This was Sharpeye and Lightstar's nest, and they were absolutely devastated about the loss of their chicks. But one was still alive, though it had an egg shell stuck in it's eye. Suddenly, the phantom felt sad for them, and for the first time in his life, he had a feeling of empathy and hoovered to them. But a bigger phantom came, and shot a ray at the couple. As the phantom watched with his now sad eye, they held wings, and in a last whisper said to each other: "I love you". Then, looking at the only chick left, Lightstar said to the phantom. "Make sure she lives". And with those last words, the ray hit them and they died together. The phantom felt a tear come out of his eye. He had seen animals cry, but didn't even know phantoms could cry. Although he hated water, he didn't mind now. He used his powers to lift the chick up, and carefully concentrated until he got the shell out of her eye. Then he hid her behind a bush. But a phantom with a much higher status, a red one, saw it, and said. "How can you? How can you help an animal? Are you crying? We phantoms don't cry! We don't care about those stinky animals? You do not deserved to live!" "I know I will die now" said the good phantom. "But I am happy to have learned about kindness and solidarity before my death. Kill me now if you want to, but please let the chick live." As a response, the phantom shot a red ray, and the first phantom ever to have a good feeling fell dead. The other phantom didn't want to let the chick live, at he didn't have empathy, but he forgot about it and went away. From the sky, Zios and Mira were looking at this. They had seen the phantom die, and although not even them had the power to bring the dead back, they made the spirit of the phantom lift up and let it's energy fill the sky forever, together with all the positive energy of the dead. As she kept on gliding, Cloudeye remembered all this, which Mira had told her. The only sequel she had from that attack was her left eye, which hadn't recovered from the damaged and didn't work very well. But she was happy that after all those years living in Jamaa with the surviving eagles, which ahd reproduced, she could go bakc to all the eagle's birthplace and help find crystals there. As for the rainforest in which she was born, she hoped one day she would fly back there. Hiya jammers, MisterChunkybuddy here! I at last managed to find a moment to post! Today's item is downright weird. I mean, thats just strange. My personal opinion about this item, which you obviously don't have to agree with, is that it looks like some old fishing net you found on crustal sands taht with the waves has attached to some strange food bowl for pets, and someone found that clump of rubish, painted it with some paint at the art studio and stuck feathers to it. Oh well, I suppose everyone has a different vision of what art is. In other news, there are really tons of rares abviable to win at the Forgotten Desert, including neon bows, whcih apparently appeared a while ago as unique items, and now are abviable again. They really look awesome. Thanks mythicalspiritwolf1 for telling me that they are now abviable to win! 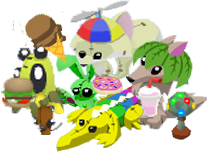 Do you think it's good or bad that now practically every single item that has ever existed in Jamaa is now abviable to win? I suppose some really rare people ar epeeved that now most rares have gone down in value, but I suppose it's better now that rares are not as rare as they used to be, because if they are not so exclusive it's easier to get them and get rare and have more fun trading, and it will be much more easier for jammers to get their dream items. And today is... Nope, not Showoff Saturday. It's Story Saturday, so start preparing your popcorn for when you look back in a while, because from now on I will post a new legend every Saturday! Check back soon for today's! And in random news, I got a new good pen for drawing, so if you want me to draw anything in particular from AJ be sure to post it in the comments and I'll try my best to do all the ones that you ask! Happy Jamming, drink coconut water because it's delicious! Hey jammers! Just a quick post to say I have been having some really busy days, so I haven't had time to post. I can't wait till all my exams finish because it's gonna be so awesome when I can post daily again. Might post today if I can find a moment. Thanks for still viewing this blog! Just wanted to say, Scooter from the Animal Jam Sky Blog (an awesome blog, click here to visit it) is having a "Draw Scooter" contest, basically consisting on drawing Scooter's snow leopard. The lines are really weird because I lost my liquid ink pen which I use for drawings and had to do it with my half dry black biro. Believe me, it's really stressing to try and draw properly with a half dry biro. 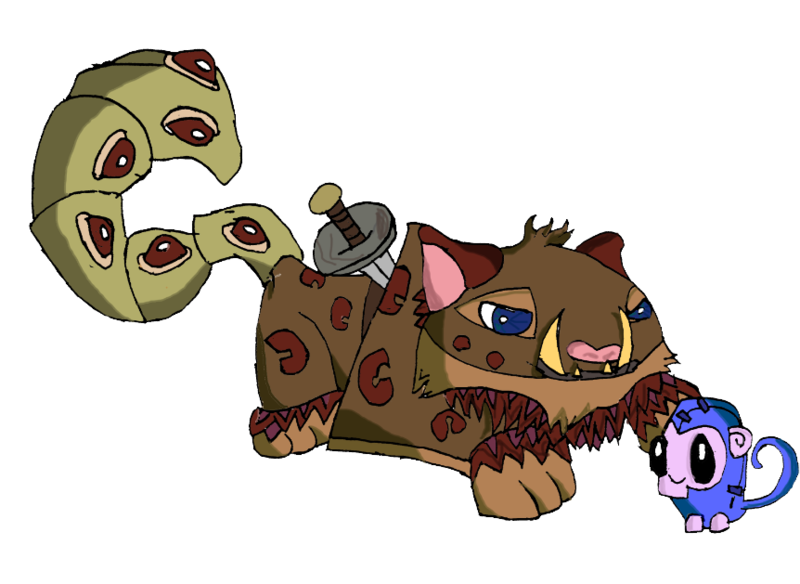 Also, I was thinking it would be cool if I drew things from Jamaa, etc that you jammers asked me to, like snowyclaw does. You know, animals and stuff. I'll probably do that when I get a new pen :p.
So, be sure to enter Scooter's contest and have a great day! Hiya jammers, MisterChunkybuddy here! I am so sorry I have not been posting much lately, I am soo busy right now. Thanks so much for viewing so much even when I don't post, we are now over 1,500,000 pageviews! So, there was an update on Thursday, mainly about the first eagle adventure! Cool! I have played a couple of times. It is quite simple: You have to find the crystals, and when you find all of one kind you get a prize. So far i've gotten two monday rares, a rocking horse and an Open Sign. 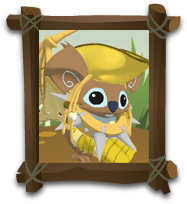 I think this way to earn rares is really cool, but quite unfair for jammers who don't have eagles or are non member. You only have 15 minutes to find as many as you can, so it is very challenging, and much easier to do with buddies. The orange ones, buried in the sand. You know they are there because of the sparks. The blue ones, you find by watering the dry oasis. You get water from the rivers. The white ones you get by sitting on cacti with sparkly clawprints. Now that is quite a sacrifice to do to get a crystal. Ouch. ... but I suppose it has something to do with those archs in which four eagles have to sit on. Those tents are great, I hope AJHQ sells them soon so I can put one on my Cosmo Den garden. The next news are, hummingbirds are back! Clawesome! I have always wanted one, and seeing as yesterday I got 2 diamonds on the daily spin (first time ever I get diamonds on there, pity I couldn't get a screenshot) I bought one. And yes, the animal was a hyena! I feel related to them, I also like hiding behind places to scare people :p I just hope they cost gems instead of diamonds, because it's really annoying how almost all new dens, pets and animals cost diamonds. I would buy one or two if I had inventory space. I am having trouble even with accepting plushies from the claw because my den inventory is full and all of the things in there are decorating one of my dens so I don't want to recycle them or pass them to a storage account, AJHQ should really give us more space specially as now there are loads of awesome item coming out. I guess I'll have to keep on stalking them on twitter until they give us space. And it would be cool if with den portals you could also connect between your own dens, right? So enjoy the update, I have almost finished the legend I am writing (it's about eagles) and I leave you with this random graphic I just made! If you don't mind wasting your time in randomness, visit my non AJ blog! 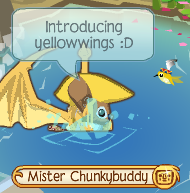 Hiya jammers, MisterChunkybuddy here! So, today there was an update! And there was new animal puzzle thingy! I solved it and this came out! Awww! But I wish AJHQ would make more animals and pets that cost gems instead of diamonds. I still think diamonds were a bad idea, as a matter of fact. They just show how AJHQ wants money. But well, I suppose they do need to be paid for their job. I have always loved this den. Cant wait for a HW party to come up! 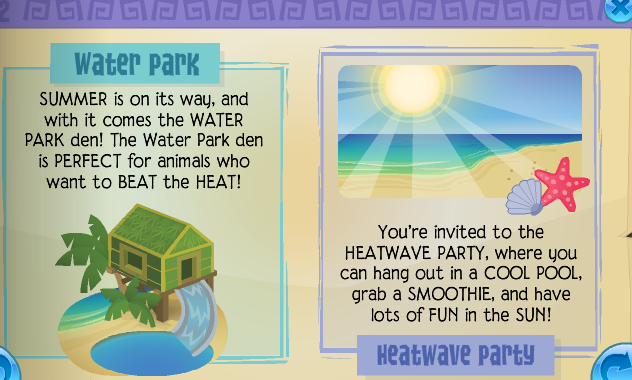 And by HW I mean Heatwave, of course, not homework. I think it's pretty obvious that this means eagle adventures are coming. See ya, might write a legend later today!